Wow! Glad I don't have one of those. 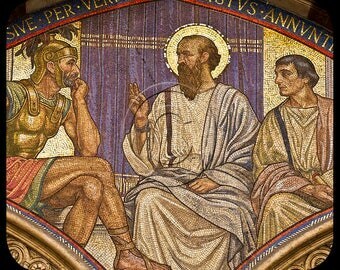 There's written in Greek " the Holy Trinity "
Looks absolutely nothing like the Holy Trinity, what were they thinking! It's not the typical icon you would see in your local Orthodox parish, also I think it's uncanonical. Do tell us what the Holy Trinity looks like. This typy is called "Mandyllion". It's pretty common. I have seen a similar one but with only 2 noses. Nut even that one is an anomaly. I've never seen anything like it I'll have to research it. It's extremely common. Many churches have it prominently above the altar. It's actually one of the very oldest types of icons in Christianity. I strongly urge you to attend an actual Orthodox parish instead of wasting time pretending to be a member of a sect you have never encountered apart from the internet. You don't understand I will NEVER attend an Ortjodox church that has set aside tradition for the heresy of ecumenism. Of course you don't understand because there are probably about 4 Orthodox churches in your area alone? For now I pray at home,in time I will be baptized. How can you defend a tradition you don't know? You aren't living any tradition right now. You can't be an Orthodox Christian willfully without a community alone in your bedroom. For someone who hasn't even been received into the Church, you're awfully quick to sit in judgment of those who are already a part of the Body of Christ. It would be wise to baptize yourself and become your own bishop. 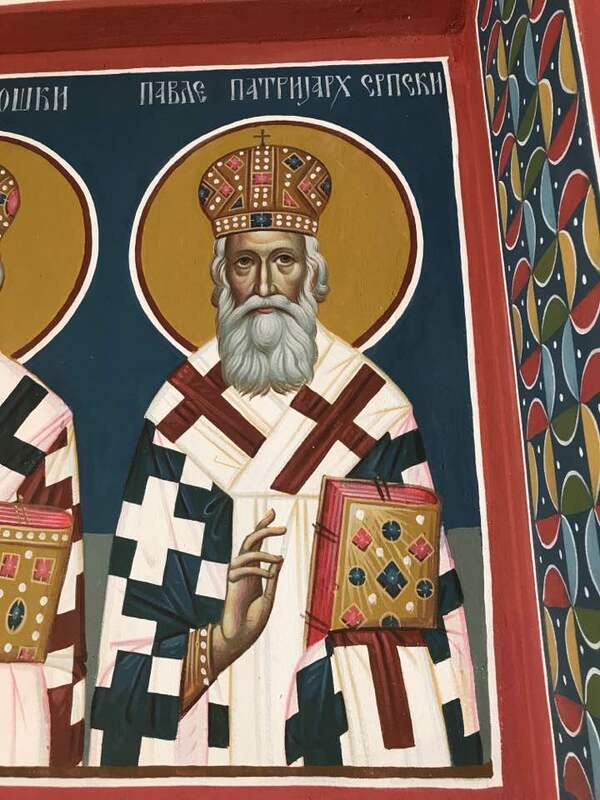 Don't forget the dastardly and piety-offending mandylion! That's a weak response, just because I'm not a baptized Orthodox Christian doesn't mean I'm not one by heart. Many Old Calendarists have no choice but to turn their home into a church, and doesn't Christ tell us to pray indoors? Hooray I learned something new today! and yes I'm glad the icon is canonical. Since you admit in a subsequent post that you don't want to turn this thread into "one of 'those' threads", I think you are sufficiently aware that your tangent violates the rules for this section, and am content to let this slide. We will both regret a reoccurrence, so let's not go there. Thread unlocked. Back on topic, everyone. Once when I visited Jordanville, I set the items I got there on the floor, and a monk saw it and said I shouldn't put ikons on the floor. 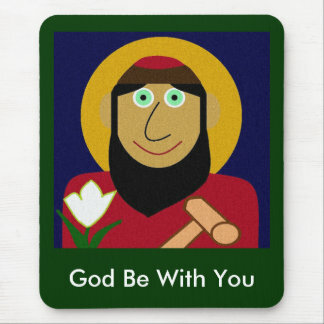 I wonder then, what about mouse pads that use saints' images. Are they acceptable? 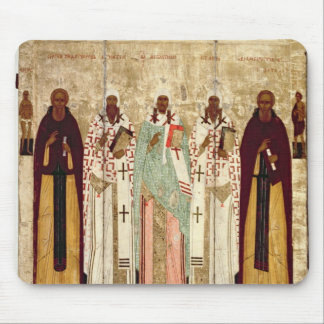 Father Hopko didn't like that kind of thing (which I would guess would include saint image mousepads, but I never heard him talk about that specifically), either. He didn't even like photos of icons in places where they were likely to be destroyed (cheap paperback covers) or deleted (desktop wallpaper). If it isn't tangible, it's not an icon as far as I'm concerned. But yeah, it bothers me how easy it is to make an icon these days. For example, I get fundraising stuff in the mail from various Orthodox groups on a regular basis, and it bothers me that they print all these icons in their newsletters and whatnot which will inevitably be destroyed. Not much we can do about it though. I have now seen two baby spiders over the last several days, each perhaps 2mm long. Sure they're harmless now, but what about when they grow up? They probably know that I killed their mom. Wow. That is really... wow. I love those! It's like a Seraphim protest march.Where is that? The first one is most interesting. Is that the Annunciation? 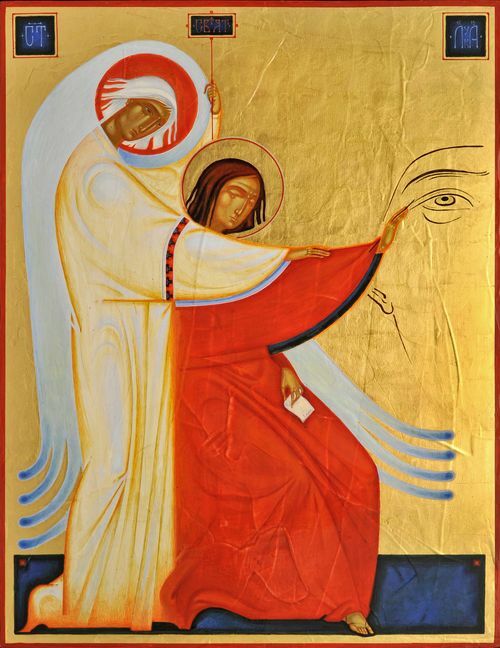 I think it's st. apostle Luke being taught by an angel to paint/write icons. I love the Dormition icon. This interpretation is very sweet. I love it too, so I'm sure it's irredeemably cacodox. It would be even better with an angel slicing off the Jew's hands. ^^yeah, without the aureole it would be correct, since depicting a certain person on frescoes and icons is one of the signals for the Church that this he/she is considered by people to be a saint, that's venerated. The Mandilion (the one with the neck) is the work of one of the most renowned modern icon painter, Archimandrit Zinon Theodore. 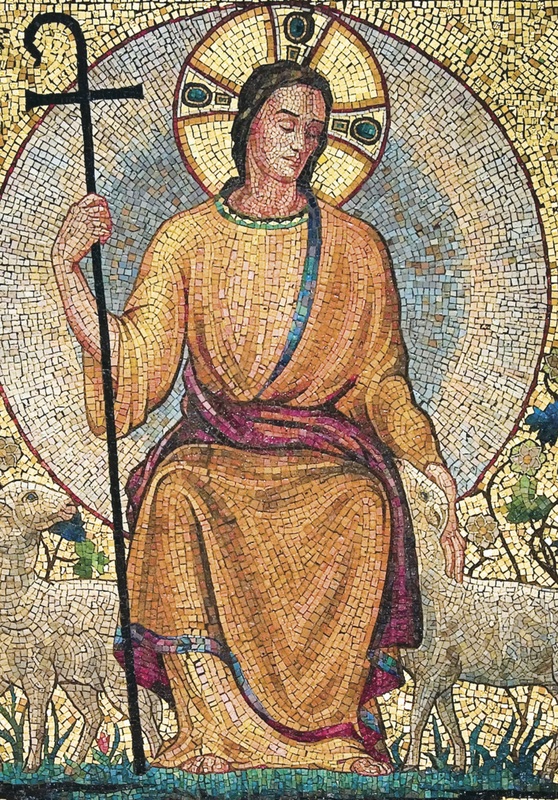 The modeling of the face is typical to Zinon's style and based on early Christian art. In contrary to other images, e.g. 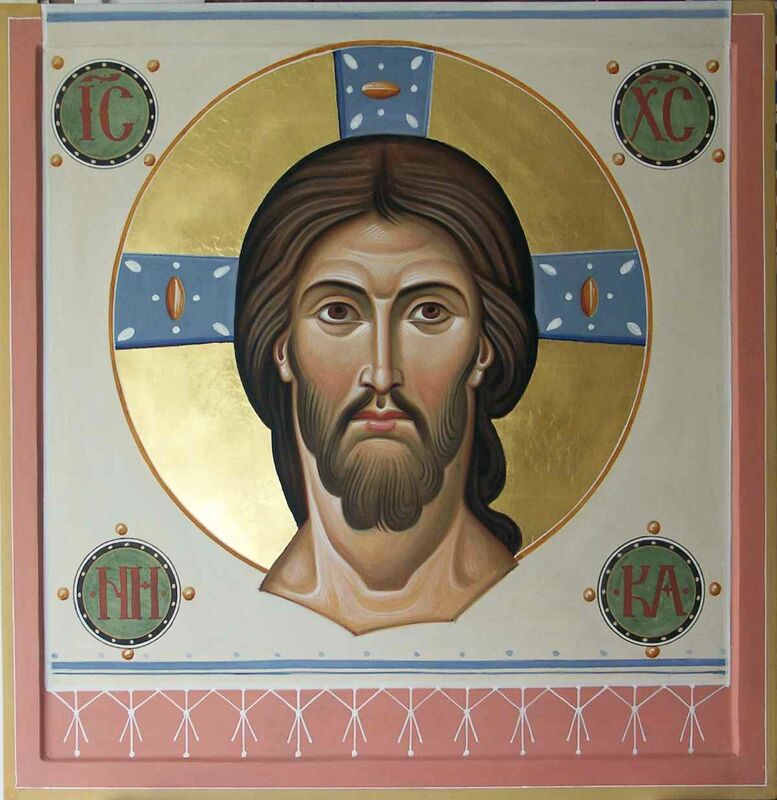 Russian icons, the picture features a very distinct thick nose, large yeys and... a neck which is usually not painted on this type of icon. 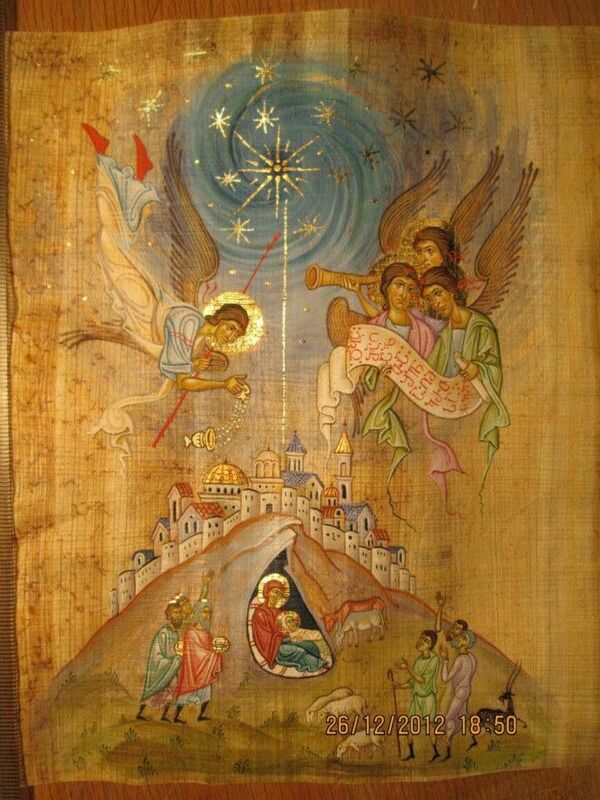 As to the second icon, the "Dormition", I would say it is an avant-garde icon. The modeling, colour choice and ornaments are very subtle and geometric, it looks very different from traditional Dormitrion icons. 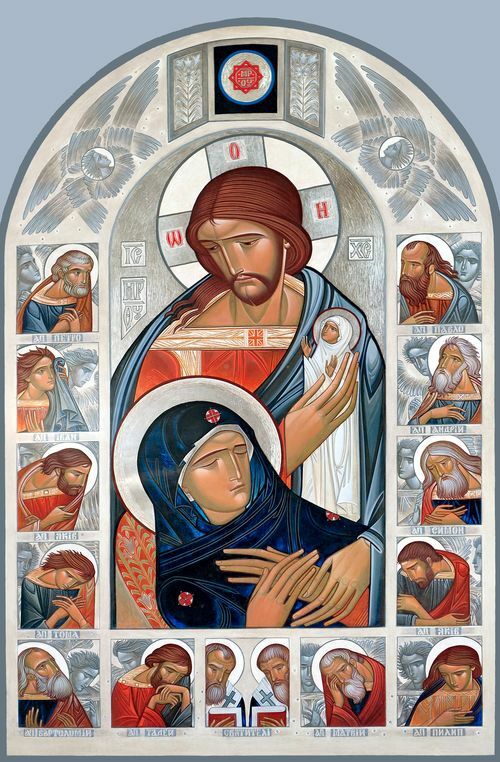 Someone said the interpretation is very "sweet" - well, it should not be... An icon painter should avoid excessive sentimentality and to some extent, avoid showing emotions in icons.